Apple fans & aficionados across the world will remember October very well. 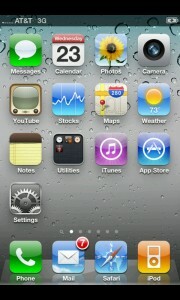 Early in the month, Apple announced the new iPhone 4S with iOS 5 (I wrote my thoughts about the announcement here). But sadly, this wasn’t the only news from the computer company. Less than 24 hours after the iPhone 4S announcement, Apple informed the world that its founder Steve Jobs had passed away. Steve has impacted so many people across the world with his products, and the company he built. He will always be remembered as a great visionary in the technology arena. You don’t need to be an Apple fan to appreciate what he’s contributed to modern computing, especially in the mobile world. I mention these two events because they are both relevant in many ways to Android developers, and especially my activities during the month of October. When I first saw the details of iOS 5 and the iPhone 4S, I was struck by an idea. Since these phones weren’t actually available in Australia yet, what if I could make my Android phone look like an iPhone, and trick people into thinking I had the new 4S? It was an intriguing thought, so of course I went to the Market and had a look – simply searching for “iPhone”. There were a couple of existing apps that claimed to imitate the iOS home screen (Springboard). They did the job adequately, but I wasn’t really satisfied. All the apps I tried had pretty glaring flaws, and wouldn’t convince anyone for very long. Besides, I wanted an iPhone launcher that actually worked – where you could click the buttons, and flip between screens realistically. Surely that wouldn’t be too hard to make? Before investing a lot of time in this idea, I decided to “test the waters”, by releasing a very basic version. This way I could see if there was actually demand for the app – how many people would download a free imitation iPhone app? I threw together a quick app in Eclipse – basically just a single ImageView with a screenshot of the iPhone 4 home screen. Nothing fancy, just a quick demo I could use to gauge demand for this kind of app. It turns out the demand was more than I expected. In just two days – with no marketing – I got over 2,000 downloads on the Android Market. And amazingly, nearly all of those were active installs. Less than 200 people uninstalled the app in those first two days. That’s an amazing response, far better than I had ever received for my previous apps. It looked like I might have a winner on my hands. My proof of concept got a great response. Could I extend that success further by adding more functionality? During the next couple of weeks I ended up rewriting the app from scratch, with a bunch of new features. Instead of just showing a static image on the screen, I used the wallpaper as a background for the activity. The icons were now rendered as separate Views in a ViewGroup. I used a ViewPager to accomplish iOS-like flipping between screens. I really enjoyed the exercise of taking an existing design (in this case, the most popular phone on the planet), and basically porting it to a new platform. Of course, my app isn’t anywhere near serious enough to be considered a “port” in the proper sense of that word. It’s more like a parody app – designed to fool your friends for a short time, but not completely replace all the functions of an iPhone. Nonetheless, it was an interesting experience to build an app conforming to someone else’s design, and not my own. My first release – the proof of concept – was given away for free, with no advertising. This isn’t a very sustainable business model, so I had to figure out a way to get some return on investment once the app started taking more of my time. I didn’t want to clutter the home screen appearance by flashy banners or promotional text. And I definitely didn’t want to use Airpush or other “push notification” ad networks. Interstitials were the only way to go. Since not all the apps on the iOS home screen have an exact equivalent on every Android phone, I chose a simple advertising method. When the user clicked an icon that couldn’t launch a relevant Android app, it would display an ad instead. About half of the icons worked in the first iteration. So clicking the Camera icon would launch the Android camera. Clicking Photos would display the Android photo gallery (built-in). 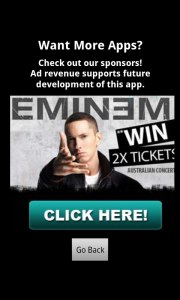 But since “Notes” doesn’t come pre-installed on many Android phones, I set up that icon to launch an interstitial ad. 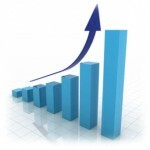 As a result of these upgrades, my app continued to grow in popularity. By mid October, I had nearly 30,000 total downloads – far more than all of my other apps combined. And it just kept going up. The chart above shows total and active installs for the month of October. As you can see, there was a sharp increase in popularity during the later half of the month. In total, during October this app was downloaded nearly 300,000 times. But even more amazing: 225,000 of those downloads occurred in the last 7 days of the month. That’s a quarter of a million downloads in just one week. So what made this app so popular? Well firstly, it was created at a very opportune time. Every man and his dog were talking about the iPhone 4S in October, and no doubt this contributed greatly to the popularity of this app. Secondly, the initial boost of downloads was enough to propel this app into AppBrain’s “Top 10 Hottest Apps” list. While AppBrain doesn’t have as wide a user base as the official Android Market, it’s still a valuable place to be featured. Thirdly, with the combined effects of organic downloads & the AppBrain exposure, this app made it into the Android Market’s “Top New Free” category. This brought in heaps of increased exposure, and this exposure in turn kept the app popular enough to continue to rise through the rankings. At one stage Fake iPhone 4S was #3 in the “Top Free Entertainment” apps list for many places in the world. Near the end of October it also appeared in the “Trending” list. With all those downloads, how much money was I making? For Fake iPhone 4S, I wrote my own custom code to switch between ad networks dynamically. So every time a full-screen interstitial ad was requested, my code would randomly choose which ad to display. I started off using 3 networks – Inner-Active, LeadBolt and Madvertise. Looking at this chart, it’s clear that Madvertise and Inner-Active were my most productive networks, followed by LeadBolt. These are the three networks that I integrated into Fake iPhone 4S. They all performed very well, and made up about 88% of my revenue for the month. 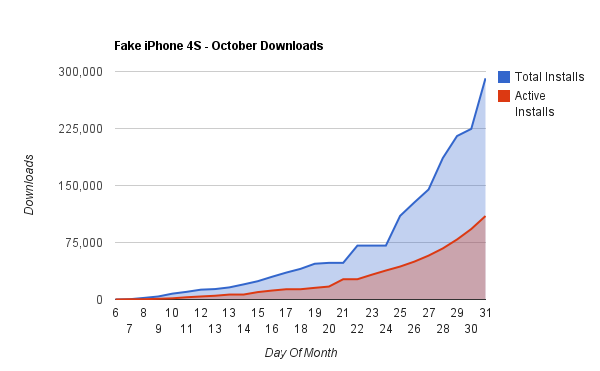 During October, Fake iPhone 4S generated a total of $1,307.40. 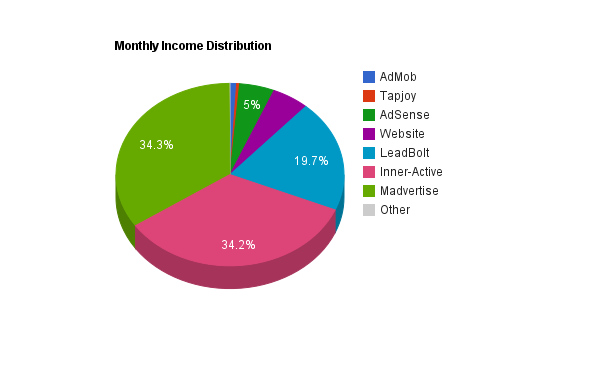 The income from all my other Android apps (using AdMob and Tapjoy) was pretty insignificant by comparison. I didn’t release any major changes this month, so this is entirely passive income. During October, all my other Android apps combined generated a total of $22.01. My website earnings (including AdSense) were still strong, but made up less than 10% of the total for this month. During October, my website brought in $151.51. So in total, that’s $1,480.92 for the month. Well over my target of $1,000 – and more than I’d earned in the previous 6 months combined! Here are the full details from all of my advertising networks, including the bits developers really want to hear – eCPM, Fill Rate and CTR. Wow – what a month! I was featured in the top trending charts on AppBrain and the Android Market. I passed my income goal less than a year after I first downloaded the Android SDK. And in the process, I discovered two new advertising networks (Inner-Active and Madvertise) which returned a significantly higher eCPM than anything else I’ve used. My success this month can be entirely attributed to one app. But I’m beginning to think this “hit” based business model is quite common amongst Android developers. That is – most apps won’t be successful. But once you create enough apps, one of them will take off in a way you never expected, and that can fund your development for years to come. Of course, if you’re a development studio with plenty of money to spend on advertising, it would be possible to produce an app and market it to create a guaranteed success. But for an independent developer, the best strategy seems to be “test the waters, and pursue any app that seems popular”. Especially now that the “Just In” section is gone from the Android Market, it’s much harder to get your app noticed if you don’t pick a well-searched title right from the beginning. It’s interesting to note that since the success of Fake iPhone 4S, all of my other apps have seen an uptick in both new downloads and active installs. By placing a simple link to my Android Market developer page, I was able to cross-promote my other apps to interested users. 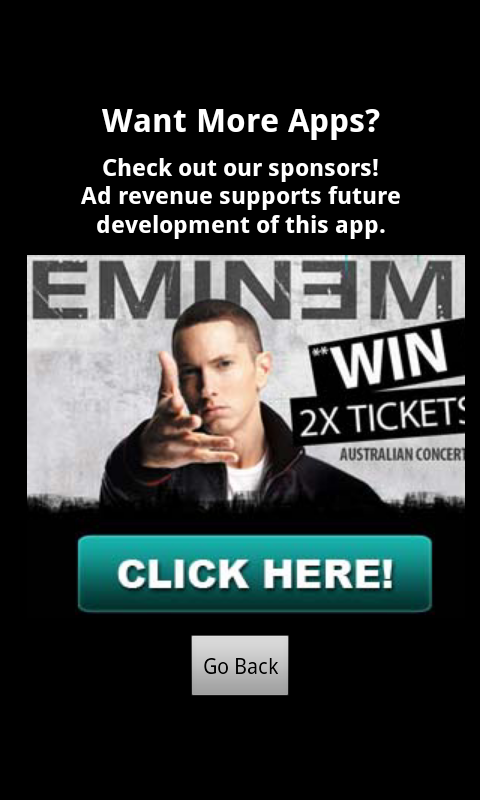 This seems a very effective way to leverage a single successful app to drive traffic to your other releases. Now that I’m handling several million ad requests in a single month, I can start looking at other ad networks. Hopefully by comparing several different networks in the same app, I’ll be able to determine which services offer the best RPM globally. I’ve placed a prominent request for feedback – along with an email address – on several of my Android app listings. In the coming few months I’ll try to actively respond to users’ emails, and follow up by adding features that have been requested. So, that’s all folks! Apologies for the very delayed report, but there was a lot of data to sift through & write up. The coming few months also promise to be a very exciting time, so stay tuned for the follow-up blog posts.